I’m an accountant by trade. So my first job was as a financial accountant or a trainee accountant. Then I moved into operations about four or five years later. 2. Which parts of your job keep you awake at night? I’ve got a philosophy in life that if there is an issue, you overreact – and by overreacting things are kept up to speed, you can then manage what you can manage. And what you can’t manage, you must then do what you must do to best mitigate any risks and circumstances. Every boss or peer I work with, teaches me something. My subordinates teach me things as well. 4. The best professional advice you’ve ever received? Do not take a job for money. Take a job that feeds your soul, your aspirations, and can help you grow while you are having fun. If you take a day, for example, you sleep for eight hours, you are at work for eight hours, you travel for a couple of hours, and you are with your family for three or four hours. The biggest part of your time awake is spent working, and your working career is the biggest part of your life. So you have to have fun. 5. The top reasons why you have been successful in business? The first thing I’ve learned throughout the years was how to prioritise; how to focus on the things that are really important… that make the organisation move forward and progress. The second thing is: don’t carry passengers. You’re on a team, and the team must perform for a business to perform. If there are weak links you’ve got to help sort it out. Staff it correctly, train the people, get their attitude correct – and they must move towards delivering. That is how to be successful. Prioritise correctly and make sure that the people around you can do it. You can’t do the work all yourself, especially when the business gets big. You have got to rely on thousands and thousands of people around you. And satisfy your customer. Without our customers we’ve got nothing. 6. Where’s the best place to prepare for leadership? Business school or on the job? You need the business school qualifications; it short-circuits your time to learn on the job. But, there is nothing like wisdom that comes with experience. You have to have experience on the ground, no matter how qualified you are. I have seen people with huge qualifications and who are almost professional academics, but then you put them in a work environment and they fail dismally. Then I have seen people with zero academic qualifications succeed handsomely at work. So I would say that work experience exceeds academic… but you are far better off to have a balance of both, and have the right appropriate academic background to short-circuit and increase your leadership. You also never stop learning. You have to go back and refresh your academics because things change. I tend to do things where I can keep active. So give me a bicycle and I’ll go for a ride. If I am on vacation or I can get into the sea, I’ll go scuba diving. I have got a car that I play with on the race tracks – I thoroughly enjoy riding fast and I find it a great stress reliever. And then spending time with the wife and kids. So to de-stress and get my adrenaline going, I’ve got to keep active. I get that heart rate up by doing something energetic or jumping in a car and going around a race track. I like to start my work day the moment I open my eyes. My wife gets irritated with me, but this morning we were up at 5:45am with a cup of tea and iPad on. Messages came through and I started sending out some emails, getting the people going. And an hour and a half later, I got up and showered – so an hour and a half of work even before getting out of bed. What will make you happy at work? The purpose of the question is to find out what drives the person, what makes them enthusiastic. If an employee is happy and they are excited [about their job], you don’t have to manage them – they will over-deliver and out-perform for you. So I need to find out what makes someone happy. Eighty percent of the people you see coming through the front door for an interview have got the skills or the degrees or the certifications to say that they can do the job. But the thing that makes a difference is the attitude that they will do it with. So searching around for what drives them – what makes them content, excited and happy – that, for me, is the key differentiator. The majority of candidates who have come to see me I have not employed because I felt our work environment and the place we work at, and the items we focus on, can’t make them happy. And if we can’t make them happy, I don’t want to employ them. It is not fair on them, it is not fair on us. 10. 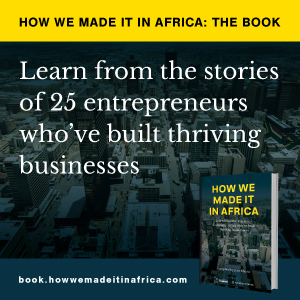 What is your message to Africa’s aspiring business leaders and entrepreneurs? There is just so much opportunity in Africa if you compare the amount of development which is required in Africa to the rest of the world. Do not underestimate the impact of small incremental change. So everyone of us who is running around trying to do something – every time we can train an individual, we are uplifting not just him, but the skill set in part of the community. Every time we can educate somebody, we are uplifting Africa. Every time we put an investment in infrastructure, we are uplifting Africa. And unless we all work on small incremental parts of that, it becomes an impossible task. So between government, parastatals, private sector, and educationists, we’ve all got to work hand-in-hand to lift Africa into its rightful place on the globe. Many years ago I was at a conference in the United States and they were showing the markets by dots on a map. They didn’t have a single dot on Africa… At that point we employed about 15,000 people, but they didn’t see a single opportunity in Africa. Whoever did the presentation must have been blind. There is just so much opportunity and so much enthusiasm. There is a buzz and an energy. Learn to harness the energy, and don’t underestimate the impact you are making to transform the continent. Clive Smith is the CEO of Tsebo Solutions Group. The company, based in South Africa, is a one-stop-shop facilities management business that provides clients with services that aren’t related to their company’s core function (like training office secretaries or on-site security). This allows companies to operate more efficiently, by focusing on their core business. Tsebo Group has managed to expand to 21 African countries and two in the Middle East.